I've been doing some tests with NanoPi M4 these days. While I'm not a professional board reviewer, here I can share some early performance numbers to you. Beware that none of these tests fit into real world use cases, they are just provided as-is. Besides, Armbian development on RK3399 boards are still at a very early stage, so any of these numbers may change in the future, due to software changes. That is to measure the power consumption on the USB side, excluding the consumption of PSU. The board is powered by the USB-C charger that came with my Huawei MateBook E, which supports 5V/2A, 9V/2A, and 12V/2A, so theoretically it is insufficient to power the NanoPi M4 board. Unfortunately I can't find a USB-C charger capable of 5V/3A output, and I have to do such test with it. What if I connected a lot of USB 3.0 device and exceeded the 5V/2A limit? Well, I did try that (connect 4 USB HDD and run cpuburn, or even connect 2 SBCs to the USB), and the answer is simple: the board crashed. But normally the board's consumption will not exceed 10W, so the charger works just fine. This is the typical consumption when you use it as an headless server. Same as (1), but running mainline kernel. The idle consumption is 1.79W, and it might need some tuning to reduce the consumption. 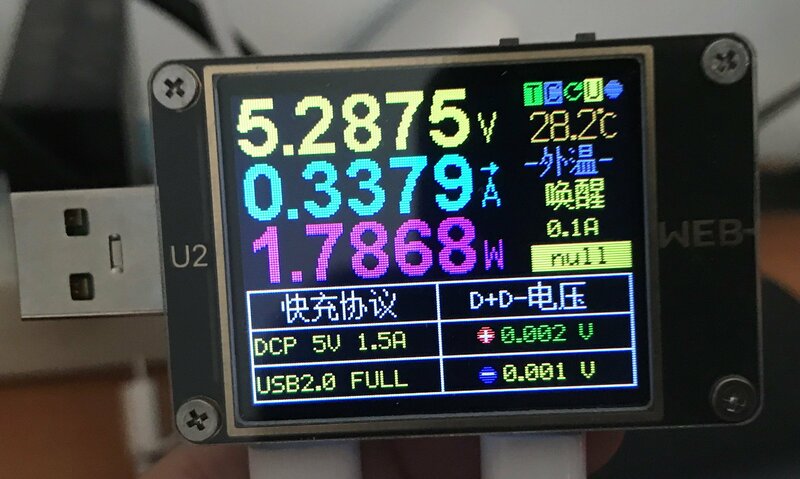 When WiFi and display are connected, it goes higher to 2.87W. With an active WiFi networking, the board consumes 4.67W, and with all CPU cores active, it consumes 9.86W. 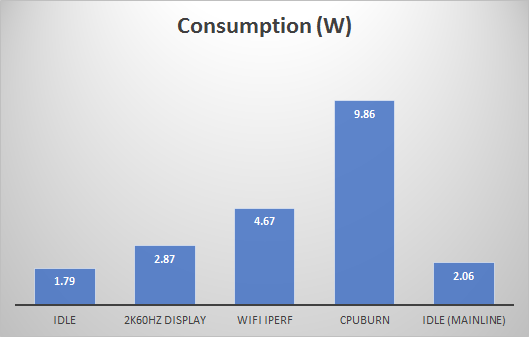 Mainline kernel has a higher idle consumption, the reason might be DDR dvfs and/or devfreq are not implemented yet. Based on these results, it seems that 5V/2A power is okay if no peripheral devices are connected. However if you connect any USB devices, it may easily exceed the 2A limit when CPU load goes higher. You can see the full sbc-bench log here. For IO performance, I use iozone to measure the performance of SD card, eMMC and USB SSD. 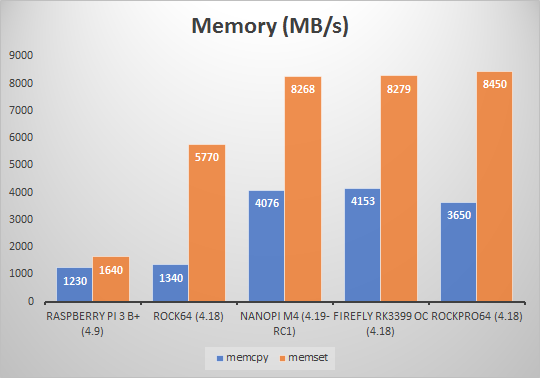 NanoPC T4's NVMe SSD results are added as a reference. SSD performance are measured by command "iozone -e -I -a -s 1G -r 4k -r 16k -r 512k -r 1024k -r 16384k -i 0 -i 1 -i 2", SD card and eMMC are using 100M instead of 1G size. NanoPi M4 comes with a 1Gbps ethernet port and a 802.11ac 2x2 MIMO WiFi module, and I tested both with iperf3. It's too complicated to analyze the performance of a WiFi connection, but so far I've never seen more than 200Mbps throughput on AP6356S. The PSU as well as the heatsink seem like mandatory accessories to me. Thanks for your testing, this would be very helpful for many end-use.r Want to know the USB 3.0 speed. Just a quick note about DRAM latency effects. We noticed that with default kernel settings the memory controller when dmc code is active increases memory access latency a lot (details). When testing efficiency of zram swap compression more or less by accident I tested another use case that is highly affected by higher memory latency. When trying to build ARM's Compute Library on a NanoPC T4 limited to 1 GB DRAM (adding extraargs="mem=1110M" to /boot/armbianEnv.txt) my first run was with default settings (/sys/bus/platform/drivers/rockchip-dmc/dmc/devfreq/dmc/governor set to dmc_ondemand). Execution time with the build job relying heavily on zram based swap: 107m9.612s. Next try with /sys/bus/platform/drivers/rockchip-dmc/dmc/devfreq/dmc/governor set to performance: 80m55.042s. Want to know the USB 3.0 speed. 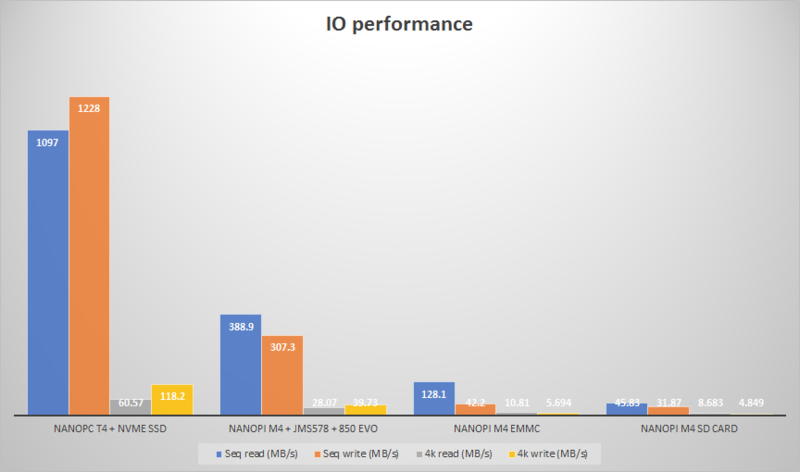 In the "IO performance" chart, NanoPi M4 + JMS578 + 850 EVO is connected via USB 3.0. So the performance is about 388/300 MB/s and 70k/99k IOPS (read/write). This result is lower than that tested on my Intel NUC (435/440 MB/s read/write tested using diskspd64.exe) but it's acceptable, since most people won't connect a SSD in this way, and typically HDD is the bottleneck. Besides, by the time of IO testing, I hadn't thought about the DDR DVFS performance impact, so the IO performance is tested with CPU governor set to "performance", but dmc governor not changed, so there might be a slightly negative performance impact. Also, USB 3.0 on M4 still doesn't work on mainline (maybe due to kernel configuration or dt issues) so I did the IO testing with 4.4 kernel, and the IO performance may be further improved by using mainline. It's also lower compared to the numbers I made with my first RK3399 device some time ago: ODROID-N1 (Hardkernel built RK's 4.4 just like ayufan without CONFIG_ARM_ROCKCHIP_DMC_DEVFREQ). But on NanoPi M4 there's always the internal VIA VL817 hub in between SuperSpeed devices and USB3 host controller and this usually affects performance as well. 373/400 MB/s read/write. So M4 numbers above need a second test anyway. Yesterday 2 sets of NanoPi M4 arrived (one 2GB and 4GB) which will make it convenient to test for stuff like heat dissipation in less time (I use one time the supplied thermal pad with the large heatsink, on the 2nd board I replaced the thermal pad with a 20x20mm copper shim of 1mm height I took away from my RockPro64). 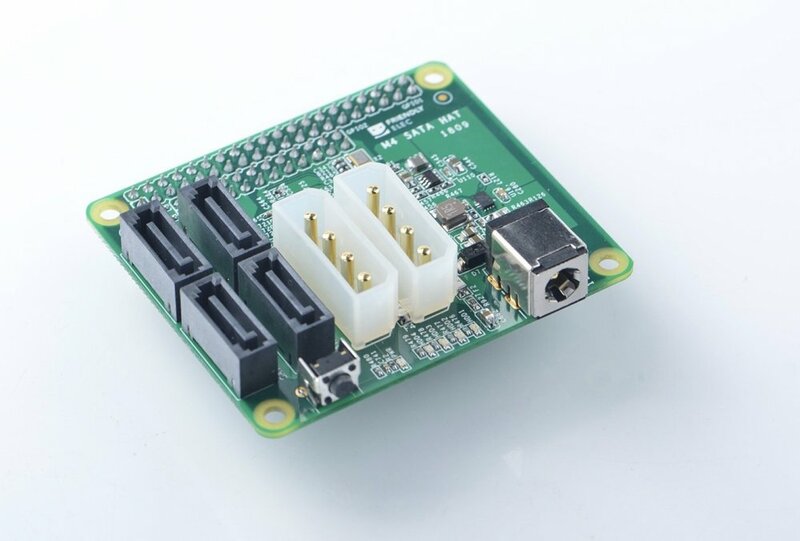 But now talking just about USB-C: NanoPi M4 while using an USB-C connector to be powered is obviously not USB PD compliant but simply uses the USB-C connector to be combined with a 'dumb' PSU that provides the necessary amount of current without any negotiation. FriendlyELEC shipped a new 5V/4A PSU with USB-A receptacle combined with a very short USB-C cable. Since the PSU is not EU style and I miss the necessary adapter I currently use my standard 'dumb' 5V/2A USB PSU which works fine for the tests I currently do. Edit: tested with my MacBook Pro USB-C charger not exceeding 500mA with 'dumb' consumers on the other end of the USB-C cable: endless boot/crash cycle. So be prepared to run into troubles combining NanoPi M4 with a real USB-C charger compliant to specs. This didn't work with the Vim2 and it also does not work with NanoPi M4. @hjc: seems you can consider yourself lucky that your USB-C charger is outputting more than 500/900 mA when feeding 'dumb' consumers. Why do I test first with 100 MB, then wait 5 minutes and test again with 2 GB? In other words: Even with an USB3 hub in between storage performance is excellent as long as only one disk is connected (with more than one disk and accesses in parallel performance will of course drop since then bus contention issues might occur and bandwidth has to be shared). But with HDDs this is no issue at all since they're too slow anyway. But to attach one or two USB3 HDDs and share them at maximum speed (~100 MB/s through network) the NanoPi M4 is perfectly fine. And now a quick look at NanoPi M4's massive heatsink. Since I have 2 boards with one board I used the supplied blue thermal pad between RK3399 and heatsink and on the other board instead of thermal pad a 20x20mm copper shim of 1 mm height with a thin film of thermal compound on both sides. Results in the first row look reasonable to me (the better the SoC's heat can be dissipated into the massive heatsink the longer it takes until SoC/board temperature rises). The 2nd row (cooling down) IMO needs more investigation since I would've thought that the cooling time would be somewhat similar. But for this I most probably need precise thermal measurements to get a clue about the heatsink temperature itself. At least now when testing with the copper shim efficiently dissipating the SoCs heat into the aluminium block the heatsink gets too hot to handle when SoC temperature is reported as being higher than ~65°C for some time. All of the above was talking about true passive mode. But of course the heatsink is sufficient to be used with active cooling too. Just blow a little bit of air laterally through the heatsink fins and the board can do whatever power hungry task you want and stays cool forever. TL;DR: the massive heatsink is great even in total passive mode when only short load bursts happen (then heat gets efficiently dissipated into the aluminium block, even better with a copper shim instead of thermal pad). For high loads over longer periods the heatsink is still fine without additional ventilation as long as you're comfortable with electronics devices being operated at higher temperatures. To improve heat dissipation simply blowing some air through the heatsink fins is sufficient. tested with my MacBook Pro USB-C charger not exceeding 500mA with 'dumb' consumers on the other end of the USB-C cable: endless boot/crash cycle. This is surprising, so using a MacBook charger on M4 is not even better than those old USB-A phone chargers with 5V 2A output without any quick charging protocol? Anyway this supports your view that the official 5V/4A charger should be purchased as well. using a MacBook charger on M4 is not even better than those old USB-A phone chargers with 5V 2A output without any quick charging protocol? The problem is that 'true' USB-C chargers limit current to 500mA or 900mA if the other end of the USB-C cable is not able to negotiate the demand for higher currents. And those 5V SBC with USB-C right now (Vim2 and now also NanoPi M4) don't do this. They act in 'dumb' mode and require the PSU to provide 'current without asking' which standard compliants USB-C chargers will refuse. So you need a dumb or tolerant charger too. I've measured booting current with my dumb PSU and this was reported as above 5.6W which would translate to +1100mA which is well above what a standards compliant USB-C charger is allowed to provide to a dumb device. I spotted two versions of the charger being sold by local resellers: 5V/2A and 5V/4A. They claim that 5V/2A is sufficient unless you need to connect any peripheral devices (like USB). Also VIM "1". I agree with you that a power delivery compliant USB-C is the only proper way to approach this, if one truly wishes to use USB-C. Can both of you keep notes on whether you get SD card corruption or failure to boot (with no obvious reason)? @botfap confirmed my hypothesis (or at the very least has strong evidence leading to the same conclusion) that the 4mA default SD drive levels is not enough. ASUS (or Rockchip, or whoever did the dev on the "miniarm" hardware) seem to have had the same idea, Tinker uses 8mA as well. 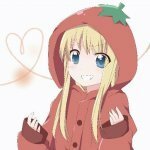 @botfap has stated 12 mA was really the only "safe" setting, I'm waiting to get more feedback. TL;DR: Rockchip SoC's appear to have a default setting on SD GPIO's that are generic to all their GPIO's and are no good for 50 MHz + operation across varying SD cards (even decent quality ones), let me know if anything weird is going on. Agreed. I'm just wondering how good the routing on these various boards really is. In any case I've set the rk3328 to 8mA, if anything presents itself on the rk3399 I'd recommend the same. Can both of you keep notes on whether you get SD card corruption or failure to boot (with no obvious reason)? Not happened here with Rockchip so far (with EspressoBin I had issues but there I boot now from USB3 and ignore the SD card slot). BTW: I now also replaced the thermal pad on my 4GB NanoPi M4 with a copper shim + thermal compound and the results are impressive again: At the end of a sbc-bench run max. temperature is now at just 73.3°C (no throttling) compared to reaching 85°C throttling included with thermal pad. @hjc did you already look into lowering DVFS voltages? In the past we did this using a special Linpack version that is able to spot undervolted DVFS OPP before the board actually crashes. Not yet, recently I'm trying to use M4 (with mainline kernel) as a network router & gateway (connect 2-3 RTL8153, set up VLAN, routing, NAT, and site to site VPN), and still trying to resolve some USB related issues. Currently with mainline kernel the USB hub must be manually reset (USBDEVFS_RESET) after reboot, or it wouldn't be usable. The official FriendlyELEC adapter is NOT needed if you have another type. *) PS: Please take note that these are actually illegal in the EU (and in Japan and most probably US), since they expose the hot plugs if you pull them out halfway. Do not use them with children around. 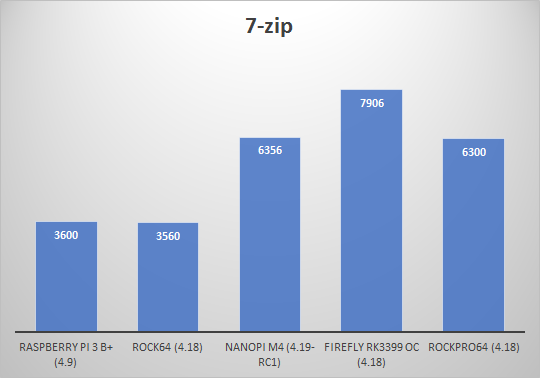 show significant differences to my NanoPi M4 (4GB). 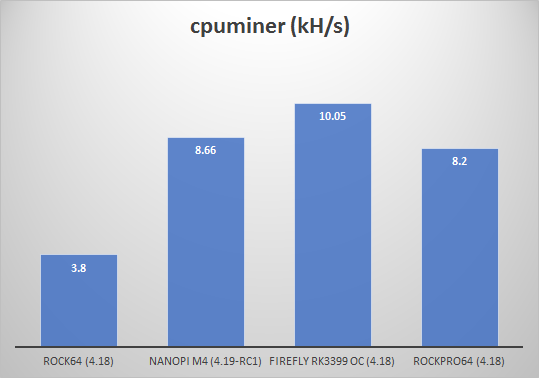 Yes, I have noticed the differences in compiler versions etc., but that you get 8.7 kH/s in CPUMiner and I get 10.6 kH/s is quite a difference - more than 22%. My system also has a copper shim (15x15x1.0mm) and reaches only 66.1 °C after cpuminer. The version is also 1.3.3, same as you used. The sbc-bench -t and -T modes provide different results (and possible insights) since the purpose of this test is to use -T as first run to heat up the board to +70°C for sure, then with the -t 50 you allow the board to cool down to 50°C which means in this mode the thermal mass of the huge heatsink plays an important role. A normal sbc-bench run starts from low load to high load so the heatsink's temperature is constantly rising but always below the SoC temperature and the final temperatures will be lower compared to the situation when the heatsink is in fact hotter than the board when the 'sbc-bench -t 50' run starts. Would be really interesting if you run with your setup 'sbc-bench.sh -T 70 ; sbc-bench.sh -t 50' as well. Shows that you shouldn't trust unfounded assumptions. I thought gcc variation would account for 3 - 4% variation at most, but not the 22% I see. I tried to run the setup you suggested; my SoC won't heat up beyond 69 °C. The temperature fluctuates between 67 and 69 °C, but never reaches 70 °C. Took it off the table and put it back in the box it came in, but this accounts only for 1 K difference. Your benchmark shows for a moment "Heating SoC from 70 °C to 70 °C", but nothing happens, and then the temperature drops again. So, would like to run the test, but cannot get it to work. I had switched over to the development kernel 4.19rc1, since your table shows 4.17 as kernel version for tests, it should be even better comparable than the 4.4 version from the first test. @Igor @hjc: With the Armbian Bionic image for download, I couldn't get wireless to work. armbian-config accepted my input for wireless up to the password, but after exiting and restarting, the NanoPi M4 didn't show up on the WLAN. I went to the nightly with the dev version of 4.19rc1. Files were needed from the full Armbian package, but even after switching to full firmware, I still get the error about `brcmfmac4356-sdio.txt` missing shown below. `brcmfmac4356-sdio.bin` is in the full firmware image, but was not in the "lite" firmware package which came with the downloaded Bionic image. When I google the error, it seems that I need to copy NVRAM contents from the device to the txt file mentioned in the error message. 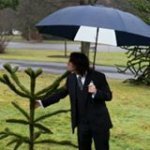 Any pointer on how to do this is welcome. Interesting. The thermal compound I used is +30 years old so maybe I should buy a new one (or search for the stuff laying around here anyway somewhere ) and try again. Used M4 with RTL8153 in routing for several days. I'm having some trouble with 4.19-rc1, when the board is doing NAT between RTL8153 and the internal Ethernet port at about ~600Mbps, the system crashes with an invalid memory page request. After digging I found that this is a kernel software issue, and ayufan's 4.18-rc8 kernel does not have the problem at all. [ 274.261462] Rebooting in 10 seconds..
BTW: I've not the slightest idea how much efforts and initial development costs are needed for such a HAT. But in case the Marvell based 4-port SATA solution will be somewhat expensive maybe designing another one with an ASMedia ASM1062 (PCIe x2 and 2 x SATA) and just one Molex for 2 drives might be an idea. Could be one design made for NEO4 that will work on M4 too with a larger (or dual-purpose) HAT PCB? I think the manufacturing cost is not so high, I am not sure for that now. The NEO4 use a differencet PCIe connector, it’s not a easy thing to fit both with one HAT, considering the signal quality. Any idea when this HAT will be released? Price point? Will there be a Male 40 pin connector on it? Will this HAT be usable with an eMMC module in the eMMC slot right underneath it? This HAT is really the number 1 selling point for me right now. Looks way more usable than the Rockpro64 SATA setup. On a different note regarding the heat sink, are you better off with a fan blowing from the top down? Or from the side for heat dissipation? This hat really would be the number one selling point! If it would be a Marvell ﻿based 4-port SATA - and omv compatible like this one for example - this will be bought without a second thought. Speed for spinning rust is somewhat irrelevant, as probably nobody will connect SSDs to this anyway. As I am new to sbc, is there any way to get native PCIe x2 ports from the 24Pin Extension port? Maybe some hardware riser board / extension or similar? And will these work without armbian out of box? Or are any kernel driver related issues to expect?